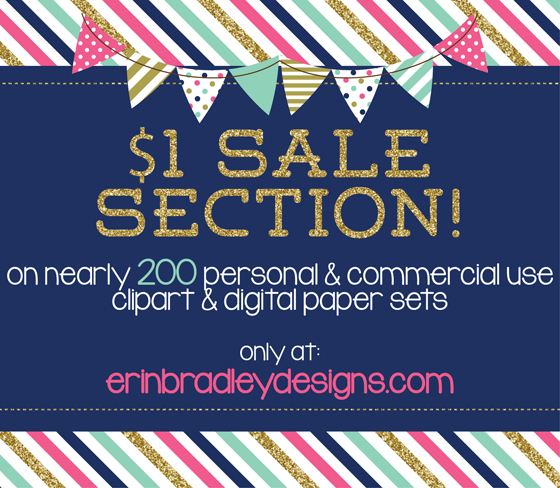 Erin Bradley Designs: $1 Sale Section for Commercial Use Graphics! $1 Sale Section for Commercial Use Graphics! Happy Monday! Over the last week I have been busy adding a new $1 sale section to my website! This section currently has nearly 200 personal & commercial use clipart & digital paper sets. These are designs that are a little bit older and that I may retire at some point to make room for new sets. You can view all the sale items at the link below.